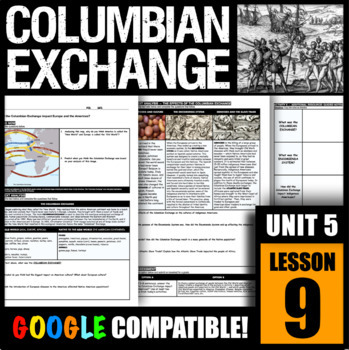 How did the Columbian Exchange impact Europe and the Americas? 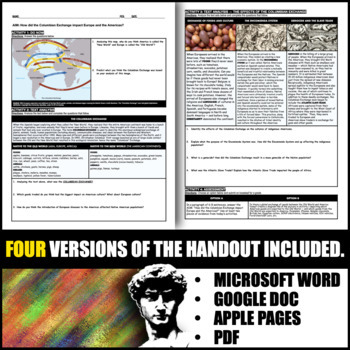 ACTIVITY 1 -- VIDEO: Students will analyze a video and identify THREE facts about the Columbian Exchange. *LINK IS PROVIDED* -- in my district, YouTube is enabled. Check to make sure that YouTube is enabled in your district prior to purchase. If not, substitute for a video of your choice. Word Doc is provided for editing. ACTIVITY 2 -- TEXT ANALYSIS: Students will compare and contrast the foods, animals, and diseases that were native to both Europe and America. They will predict how the first interactions between the two would affect each other. 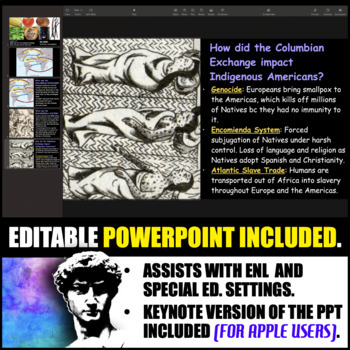 ACTIVITY 3 -- GRAPHIC ORGANIZER: Students will complete a graphic organizer in which they determine the positive and negative effects of the Columbian Exchange. ASSESSMENT: Students may answer the AIM using the R.A.C.E.S. format (FREE Download Here).